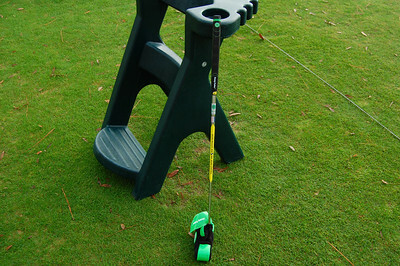 The Heavy Putter came onto the scene in 2005 and has done very well since its inception. Since that time there have been countless reviews on this line both positive and negative. In theory, this putter makes all the sense in the world. But as the readers of The Hackers Paradise know, logic and golf are two things that rarely go together these days. There is only one way to describe the Heavy Putter. That word is obviously HEAVY! To understand this putter better, we spoke with some of the Heavy Putter marketing people and this is a summary of what they had to say. 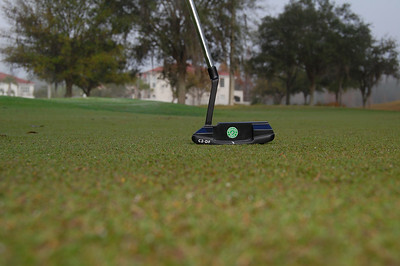 The Heavy Putter remains the first and only putter that automatically improves the consistency of the putting stroke. Its unprecedented application of a heavier mass head and counter-balanced weight in the grip end of the shaft promotes greater stroke stability, consistent swing paths, uniform pace, precise distance and directional control, and tightens the end-over-end golf ball roll. They also have a little part of their website designed around giving out the facts on the technology. You can read all about that Here. After speaking with them, about a week later a package arrived and inside was the Heavy Putter. First take was that it was VERY HEAVY. Here are the technical specs for the series we are reviewing. Once you get over the initial shock of just how heavy it is, the putter looks fairly standard. The DF, or Deep Face Series is the newest line of innovative putters from Boccieri Golf. The Deep Face technology raises the center of gravity “CG” by combining innovative design elements with a Â¼ inch increase in the height of the putter face. By raising the CG, the sweet spot on the face more closely aligns with the equator of the golf ball. With a conventional putter, the golfer must consistently raise the putter approximately Â½ inch off the ground in order to strike the sweet spot. Achieving this optimal vertical impact point with consistency is extremely difficult. In fact, with so many putter companies talking about skid-roll and putter face technology, the reality is simply that many golfers are striking the ball too low which causes the dreaded skip and bounce. The DF series sets the CG so that it closely aligns with the equator of the ball, allowing the golfer to simply raise the putter just above the surface to strike the ball on the sweet spot. This optimal transfer of energy results in better roll and more consistent distance control. Based on the number of requests THP has received about this technology we were really excited about trying this out in our bag for a few rounds. So once we got the putter unwrapped and ready to go we took it out to the course. For this review we did something a little different. We still had multiple testers, but worked solely with the Heavy Putter rather than comparing it to conventional putters. The first day it was just myself and a local teaching professional. We both hit the putting green and worked on short putts. We each lined up 5 balls at the 5 foot mark, 10 foot mark, 15 foot mark, and 20 foot mark. The results for us were very odd. From both the 5 foot mark and 10 foot mark, we could not miss. It was like nothing we had ever seen before. When we got to the 15 foot mark and the 20 foot mark, it got ugly fast. We were either 5 feet short or 10 feet passed the hole each and every putt. The course we were testing this at has very fast greens and judging speed with this putter was incredibly hard in practice. After this drill we took the putter out on the course for 18 holes and both of us used it. We had similar results on the course. The number of putts compared to my average was about the same, however the reason behind it was very different. When my approach shot was good, I was rewarded because inside of 10 feet, I could not miss. When either one of us was left with 20-25 feet to the hole we were three-putting and doing so most of the time by putting the ball 10 feet passed the hole. After our mixed results round we decided to take it back to the putting green the following day. THP had assembled six golfers to test out the Heavy Putter and see what they thought of the “heavy tool”. We used the same drill that was used the day before and each person took turns going through the drill. Once again the results were very mixed. The four golfers that were higher handicaps really enjoyed this club. They felt as though their hands were in place and that the putter was doing the work for them. The two golfers that were lower handicaps, had the same issues that both myself and the teaching professional had the prior day. So what have we learned in using this flat stick for a little while now? The consensus seems to be that it is just not for everyone. 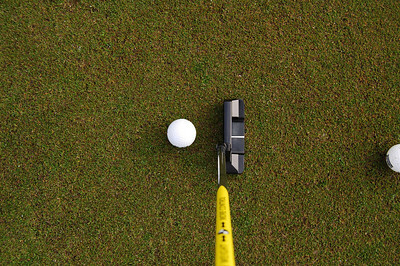 We think that for any person struggling with their putting, this tool could cure them. All of us were convinced that as a training aid, the Heavy Putter would be worth its weight in gold. It definitely promotes the proper stroke and keeps you on line for making more putts. We really enjoyed the way the ball came off the face as well. The grooves promoted a great roll each and every time. However, I could not keep this in my bag as my on course putter. Gauging speed on a course with fast greens was virtually impossible. If you are a golfer that plays many different courses, this putter could cause nightmares. If you are someone that plays primarily the same course and the greens are not too fast, the Heavy Putter could take strokes off of your game immediately. 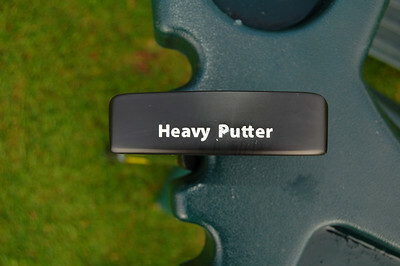 To read more about the Heavy Putter and find out where you can try one out head over to Heavy Putter. I have an older model of this putter and love it. It took me almost 3 months of practicing with it before I was really used to it. I got it like the reviewer says to promote proper techniqe and it does just that. Interesting review. 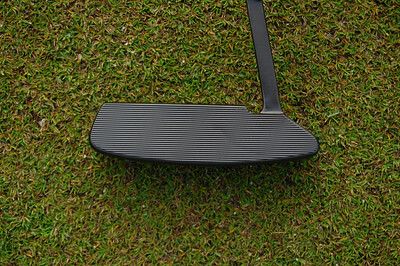 I wonder if the results would change if you played this putter more often and got use to it. That may be the case. It definitely promotes the proper stroke, but after a few weeks of trying it out, I was still having speed issues. I think as a tool or anyone that is struggling with their putting. This should be checked out. Great review. I find your reviews to really hit it spot on. After reading this one, I went over to my local Edwin Watts and tried one out. Love the feel. Might have to put this one in my bag. Great read. I might have to game one of these soon. Interesting. What was the effect on your putting when you switched back to your regular putter? In other words, did you find that using the Heavy Putter for a while improved your stroke when you returned to your standard putter (with which you can judge speed)?